Throw a Barnyard or Farm party for children and adults with the help of PartyCheap’s Farm party supplies and farm decorations. You can throw a Farm Party for almost any reason. A Barnyard Party is perfect for a child's birthday. Decorate with farm animal and tractor cutout decorations. 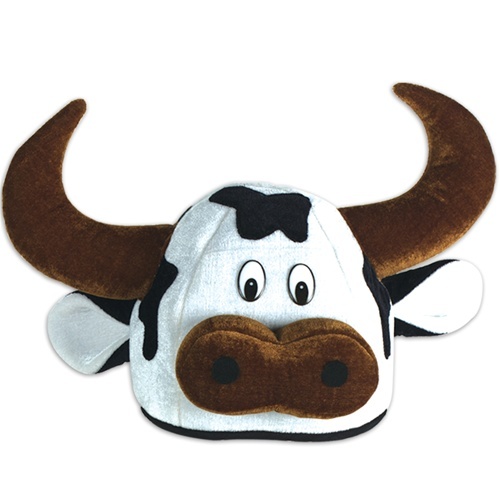 Or try out our humorous Cow Head’s Hat which is sure to bring many laughs at your next party! If you are having an adult Farm or Barnyard Party, try decorating with more realistic-looking animals. Check out all of our Farm party supplies and Farm decorations to really deck out your Farm theme party. Don't forget to add solid Green and Yellow Decorations to coordinate with your other decor and accessories. Struggling to think of some farm party ideas? Browse our website and in just minutes your mind will be flooded with fun and creative ideas! We also offer bulk discounts to meet every party budget! Cow Head Hat. This is sure to be a hit at your farm theme party! It’s made from a plush material and fits up to a medium sized adult head. The adults, children or both can wear this all night long.It’s utterly amazing! You can get creative in decorating your table with our Green Grass Mats by placing a toy on it, or the Cow Head Hat. The mat is made from tissue paper, measuring 15 inches by 30 inches. The blades of grass measure 2.5 inches tall and each package comes with two tissue mats. Kids of all ages love animals, so why not have a Barnyard Party? We offer a full line of barnyard party decorations like the Farm Photo Prop as well as many others. We also carry lots of green and yellow decorations to fill the empty spaces. You can browse through all of our farm party supplies and cow decorations here or use the search feature to find specific products. No matter what type of farm party ideas you may have, make sure you party with us right here at PartyCheap.com!